Organic and Natural Beauty Products! Do you have someone who enjoys being pampered but only wants it done via organic and nautral beauty products? If so, Maple Holistics is the place to shop! Their prices are reasonable, their products work, and they're very conscious about what goes in them. Maple Holistics has shampoo for men and women too. 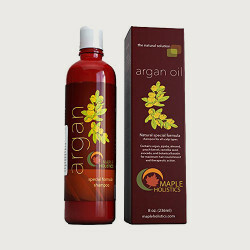 this argan oil version is hypoallergenic and made with no harsh ingredients. 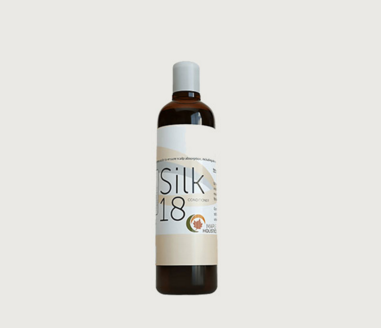 It is sulfate free, contains no parabens, is cruelty-free and vegan-friendly. The best thing, it works! It's one thing to be conscious of what you're putting into your products, but another to do that and have them work great too. This shampoo has been wonderful for keeping my hair soft and ensuring it is very clean too. I love it. 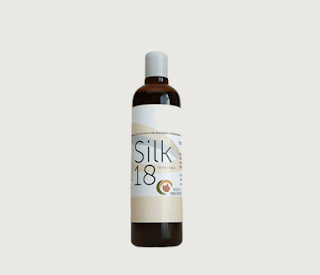 The Silk 18 natural hair conditioner is every bit as good, but because I had the set above, and my daughter-in-law has this beautiful long, silky hair (and she loves her products to be natural), I gave this bottle to her. No complaints, and I'm not surprised. This really is a great product line and brand! I'm happy to say they have skin products at Maple Holistics as well. 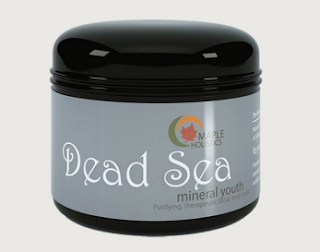 This Dead Sea mineral youth is a nice, rich formula that contains therapetuic qualities and minerals. It is made with 100% pure Dead Sea Mud along with essential oil synergy to maximize results for healthy, toned-looking skin. It is Pelotherapy at its finest. The Vitamin C Anti-Aging Serum takes the traditional concept of topically applying vitamin C and gives it a boost of therapeutic and natural ingredients to maximize effectiveness and sustainability. It is designed to help correct the look of aging skin and leave you with a more toned, youthful and healthy looking face. 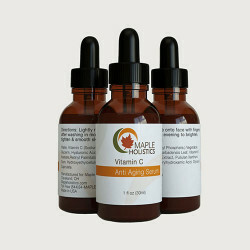 These are but a few of the products that they offer at Maple Holistics. You can learn more about them by visiting their website. If you're looking to switch to natural products, or already know and love them, Maple Holistics really does offer affordable, high quality products that work. I recommend them, 100%, and that's something I rarely do. So...if you're stuffing those stocking for the holidays with all natural beauty products (or you just want some for yourself), now's the time to head on over. Shipping is free for orders over $25, and all products have a 100% satisfaction, money-back guarantee. I try to go natural with products when I can... It is so much better for your hair and skin. The Argon oil and these other products are amazing and I would love to try them because they are all natural! I love that these stocking fillers are catered to men as well as our scalps can be quite different and I like that it is holistic! Thanks for the ideas! These would be great for my mom. Sounds wonderful and glad that they work too! Love that they have a wide range to cater to the different skincare and hair care needs. I love hair products that have argan or argan oil in it, makes my hair softer and shinier as well. It's really awesome. Those would be good stocking stuffers for myself. I better show "Santa" these before he packs up the sleigh. Great review. I've been wanting to try Argon oil, as well as Vit C on my face. I love all natural products! I haven't tried this brand yet, sounds amazing! I would love to have those Argan oil supplements for healthy hair and scalp. Sometimes the weather can be too harsh on our hair. Thanks for the great product descriptions. I will check these items out. It's so nice to find a line of products for the more natural-minded folks. What a great array of stocking stuffers! Great to know about Maple Holistics! They have some terrific products! These sound like great products. I like using Argan oil Shampoo as it helps tame the frizz. I will look for this brand. 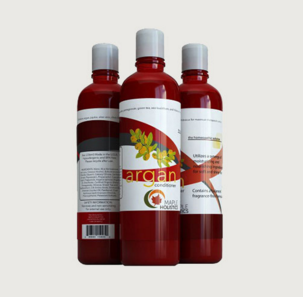 I love using Argan oil, but have never tried it in a shampoo! I must check this out! I would really like to try some of these products myself, especially the shampoos. Whenever possible I will choose natural products first. I'm a huge fan of anything organic and natural. And, I would love to try these products most especially the Argan Oil.